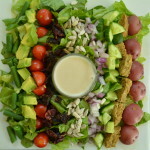 When it comes to making salads and bowls, it’s all about the sauces and dressings. I mean I love the veggies, beans and grains…but isn’t it the wonderful flavorful sauces and dressings that really make the dish? I love this recipe because it is very easy to prepare and it’s sweet and creamy. 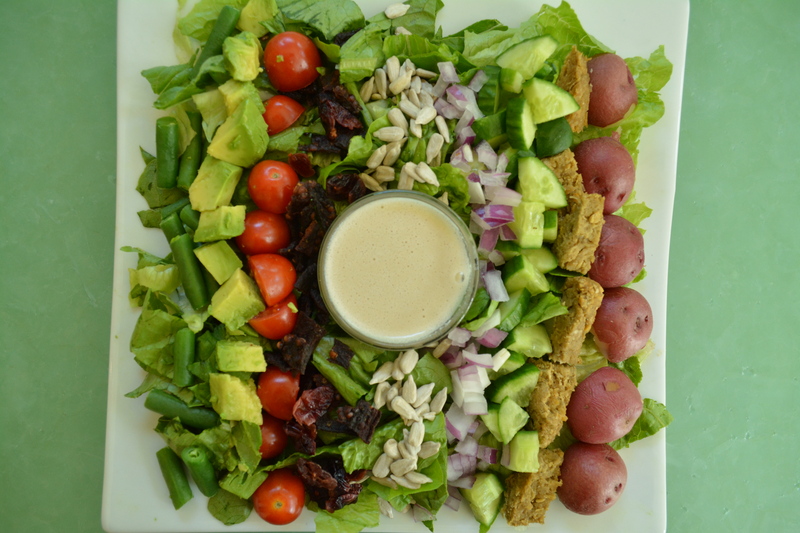 I used it to dress this vegan Cobb Salad made with grilled seitan, avocado, potatoes, tomatoes, sunflower seeds, green beans, cucumber, romaine, dried cranberries and crispy eggplant bacon. Yum! The dressing is also relatively low in calories and fat. In fact, when comparing Kim’s dressing with a non-vegan sweet creamy mustard dressing made with honey, the former is a hands-down nutritional winner. It is rich in dietary fiber, has almost half the number of calories and just a fraction of the fat and saturated fat. At the end of the YouTube video mentioned above, I share the precise nutritional data for this comparison. This sweet and creamy dressing is easy to prepare and low in calories and fat. Combine all the ingredients in a high-powered blender and blend until smooth and creamy. Store in an airtight container in the refrigerator for up to a week. It is possible to use a standard (rather than high-powered) blender for this recipe. Soak the cashews for two hours or more first until they become soft and then drain then before using. Additionally, if using dates, soak those for up to an hour and then drain before using.